The days are getting warmer so your drinks should be getting cooler - here are our favourite ice cold drinks to beat the heat! This recipe is alcohol free for the kids (doesn’t mean you can’t add a little something though!). Not a fan of Watermelon? Don’t worry, just swap the syrup with another flavour from our huge range of Monin syrups. Maybe Raspberry? Or Mint? 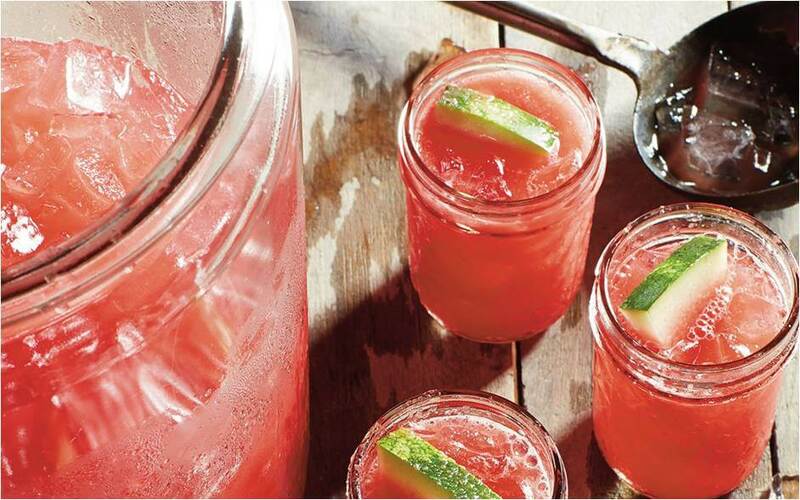 Personalise this refreshing recipe and tell us how you get on. Pour the lemonade and ice cubes into the blender, then blend until crushed. Add the watermelon syrup and mix. Garnish with fruit and serve immediately. Don’t fancy a fruity drink just yet? Time to bring your mug of coffee back! 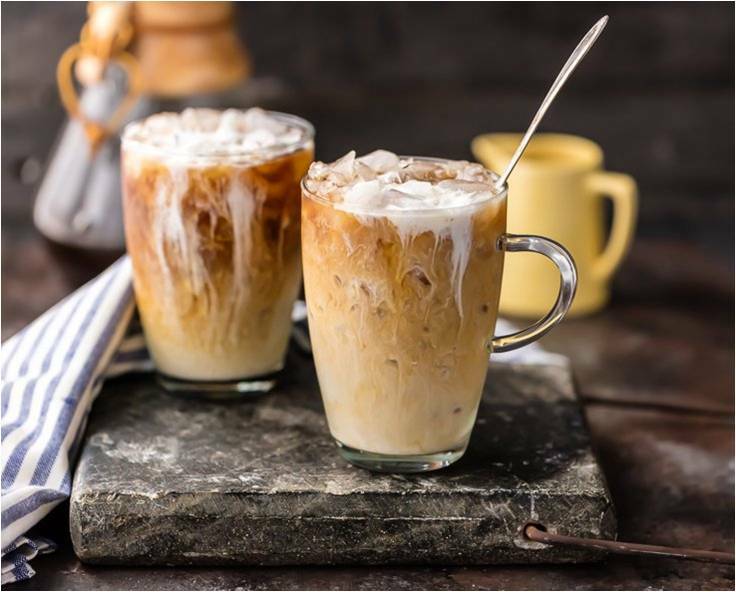 How about trying out this new easy way to make an iced coffee at home? It only takes 5 minutes and no unusual equipment required. All you need is your favourite espresso beans (we suggest Lavazza Super Crema), milk, optional flavouring and ice! If you like it creamy, then add more milk. If you like it sweet, add more sugar. If you want it flavoured then add some syrup. It’s your drink, make it how you like it. Transfer your double espresso (made with 14g of coffee beans) into a long glass. Take 1 cup of your preferred type of cold milk and slowly pour over the espresso, making sure you leave enough room for the ice. If you opted for your iced coffee to be flavoured, then take 2oz of your favourite flavouring and pour into the glass. If you want it sweetened then add some sugar and mix. Put 1 large handful of ice, either crushed of whole, in your espresso. VOILA!!! You’ve just made yourself your very own iced coffee. Now sit back, relax, and enjoy the summer. For those special occasions where a little bit of alcohol isn’t frowned upon, you can always try and make our new Exotic Rose Champagne Cocktail. Its smooth, its tangy and it looks irresistible. Using a few of our new Routin 1883 syrups you can create your very own cocktails, ready for any occasion. 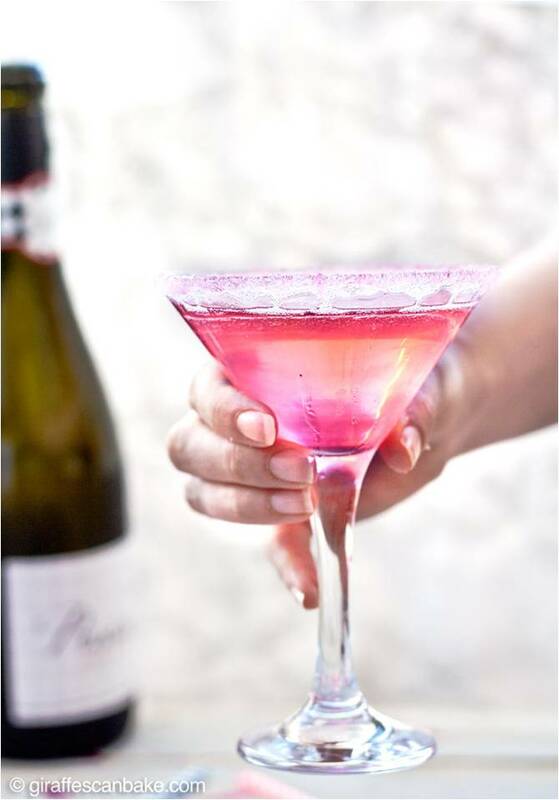 Pour a small amount of sugar cane syrup into a saucer and dip the rim of the champagne glasses into it. Pour the vodka and Rose syrup to the glass. Garnish with your favourite berries. We really hope you give these quick recipes a try. They are utterly delicious and super fast to make. You can also use different flavours of syrup, mixing and matching them to create wild variations of these summer favourites. Or maybe you want to add a squirt of whipped cream to your coffee? Possibly even a flake if you’re feeling devilish! If you are already a customer, you will already know that we recently moved to www.a1coffee.net, so don't forget to bookmark us or change your contact information for us. For anyone emailing us, we are now at admin@coffeeworldgroup.com. They are the only changes, it's otherwise business as usual. This means the same great product range, same prices, same staff and same location - the only change is the web address and email. Don't forget to keep an eye on our seasonal products page, the weather is starting to warm up and so we will be adding more delicious smoothie recipes, as well as fresh ideas for frappes and long iced drinks. It might be freezing outside, but warm yourself up with this festive cocktail. Simple shake the ingredients together in a cocktail shaker and serve over ice. If you’re a fan of the chocolate orange, this cocktail perfect for you! Wet the rims of 4 coupe glasses and dip in the dark chocolate. Add vodka, crème de cacao and Monin orange syrup to cocktail shake, shake, pour into decorated glasses and enjoy! If you love candy canes, this little red and green layered shot is the one for you. Pour grenadine to about 1/3 of your shot glass. Carefully layer equal parts of the creme de menthe, then the peppermint schnapps. Don’t think we’ve forgotten about the kids and those of you who prefer a soft drink – this festively named mocktail is refreshing and so Christmassy. Heat the cranberry juice until warm (not too hot!) and pour over remaining ingredients – stir and enjoy your Red Rudolph! With our huge range of flavoured syrups there’s no drink you can’t make! Get creative with your drinks this Christmas and explore our range of cocktail syrups – we have something everyone will love. A1 Coffee wishes you a very Merry Christmas! This year, A1 Coffee is striving to bring all of our favourite recipes, tips and tricks to you for Christmas. Stocking new products and more flavours than ever, we have some very big ideas to share with you! Starting off with a plain and simple Latte, add one shot of syrup (from our range of Egg Nog syrups) and stir into the Espresso until dissolved. Add the steamed milk, garnish with squirty cream, and select the topping of your choice from our massive range. Not only does this recipe work with Egg Nog, but it also works wonders with many other flavours. Our top sellers this Christmas include Christmas Pudding, Tiramisu (Starbucks’ winter favourite), Gingerbread and many, many more! For this recipe you are going to need a rich Hot Chocolate (preferably dark, but milk works) and a shot of Monin Orange Curacao syrup. Add the shot of syrup and mix well. 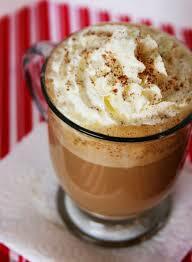 Just like the Egg Nog Latte, garnish with lots of whipped cream and toppings of your choice. Other flavours that work magic in Hot Chocolates include Salted Caramel (very popular this year), Peppermint, Chocolate Cookie and more! 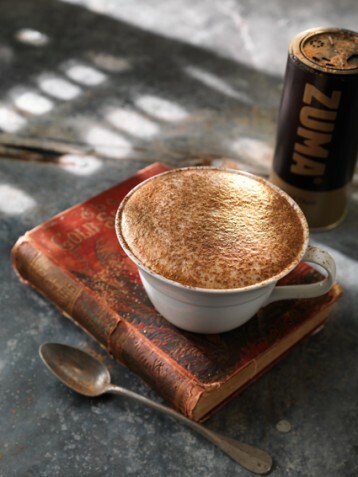 Zuma Gold Dust is an amazing new topping that will fast become one of your favourites. Ideal for adding to your frothy coffees and Hot Chocolate to create something truly special, it adds a regal touch that will really grab your attention. As well as adding a delicious layer of chocolate, the speckled gold colours shimmer on the top of your drink - try using a dusting of this with a coffee stencil for a seriously professional presentation. Or you can be adventurous by mixing it into your Hot Chocolate powder before you mix it with water, to give you a gold shimmer throughout your drink! Using an electric mixer, beat the whipping cream into soft peaks. Add the powdered sugar and brandy and beat into the peaks. Place the ground coffee, sugar, cardamom, nutmeg and cinnamon into a coffee filter, then mix gently with a spoon. Add water to the coffee machine and brew according to manufacturer’s instructions. Divide the coffee amongst 8 cups. Finally, garnish with cream and serve immediately. We also stock a massive range of stencils for both commercial and personal use. We stock stencils for occasions including Halloween and Christmas, as well as stencils with messages to be used all year round. Our Christmas range includes pictures such as Christmas Trees and Snowmen, and messages including “Happy Xmas” and many more! All you will need is a fresh jug of filter coffee that has been allowed to cool, a bottle of vanilla vodka and a bottle of Baileys. 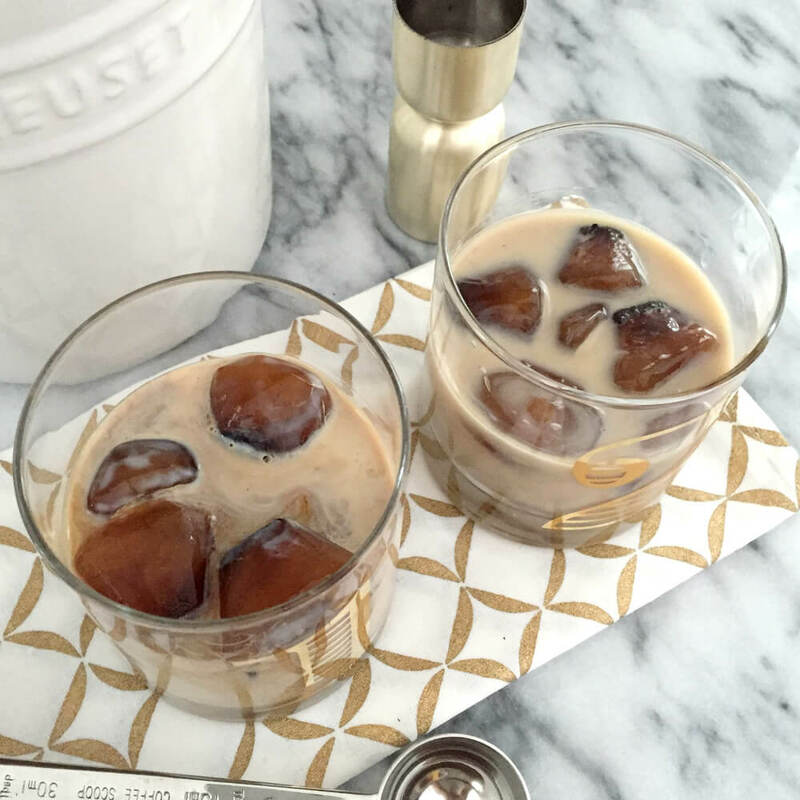 Freeze the coffee in ice cube trays overnight, then the next day when you are ready to serve, place 4 coffee ice cubes into a glass, along with 2 shots of vodka then top up the glass with Baileys! We’ve got the whole range, and we’re proud to say we’ve been helping caterers with their coffee needs for many years, and we struggle to think of a time where we’ve had to turn around and say “why no, I don’t think we can supply that.” From sugar, syrups, disposable cups and vending machine products to simply coffee, we’ve got it all. Catering can be hard at the best of times, whether you’re working in one location or moving around, you’ve never sure whose going to walk through the door next and ask if you have “amaretto flavoured Monin syrup” or “is that served in an insulated coffee cup” Customers like to be unpredictable! Well we have all the coffee catering supplies you could possibly need right here. Explore our entire range today, and start discovering why caterers love A1 Coffee! Cocktail syrups are a great way of giving your cocktails a refresh, and an exciting way to explore brand new flavours! We’ve put together some of our favourite cocktail syrups and what you can do with them to spice up your cocktails during the colder months. Where can I buy cocktail syrups? Here at A1 Coffee we have a whole range of cocktail syrups to suit all taste buds! The perfect autumnal flavour, and what’s even better, is it works with so many other flavours too. Subtle and perfect for this time of year. Toasting marshmallows requires fire, sticks and some preparation! However with this wonderful flavour, cocktails have never been more convenient or tastier! The modern day Christmas tradition! Love your cocktails but want to get in the festive mood too? Well this eggnog syrup will help you get the best of both worlds! If there’s a Barista tool that most professionals will say they couldn’t live without it’s the Portafilter. It often blends into the ever impressive espresso machine without making too much of a fuss, however this tool, is the secret to your perfect coffee, and has loads of elements. All of which make up the perfect barista tool. This is why at A1 coffee we stock the full range of Portafilter parts, so you’ll never need to panic if you’re in search of one! A Portafilter is a tool made of metal, with a rubber handle. This tool composes of a basket, spout and a handle. You place a puck of coffee in the basket, attach to a coffee machine to create a seal, then water is pumped through to create a wonderful coffee! Here at A1 Coffee, we stock a whole range of vending machine drinks, from the energy boosting coffee, to the heart-warming hot chocolate, making sure offices and cafes are always in full supply of everyone’s favourite hot drinks! The Unsung Hero of the Office! Sitting quietly out of the way, it rarely makes a fuss and listens every single day to the office gossip too. It probably knows more about the new HR team member than anyone else does & what Keith got up to at the weekend… Not only that, it’s provided you and your team with a Monday morning coffee boost, the mid-day caffeine cravings, the attack of the sweet tooth, and even helped you get through the cold winter mornings. The drinks vending machine in the office gets a tough time, but we’re fans here at A1 Coffee. Although we don’t like to brag, the drinks vending machine is very often filled with speciality vending machine hot chocolate and vending machine coffee direct from us! To the point, actually, maybe we take it all back, we’re the unsung hero of your office, or we’re at least going to take some credit for it. The fitness fanatic: Coffee can (apparently) improve your workout! Meaning you can work out for longer and with a greater effect. Plus, if you’re brave enough to have simply black coffee, it’s a super low calorie energy boost too. A1 Coffee recommendation: We supply Monin Sugar free syrups. So for those who are looking to buy coffee supplies with an extra kick, but are dealing with some super fitness fanatics, you can add in flavour without adding in sugar! The non-morning person: Of course, we all know someone, or in fact you may have 100’s of customers that rely on a cup of coffee in the morning, and with it’s powerful energy boost what else can you ask for. A1 Coffee Recommendation: Our Takeaway cups are perfect if you’re serving customers that are in a rush (a sleepy one) to get to the office! The one with the sweet-tooth: Coffee has become an art! We love all the different recipes and ideas that come with being a coffee supplier, from wonderful Sweetbird syrups to supplying vending machines with a range of different hot drinks and coffees. 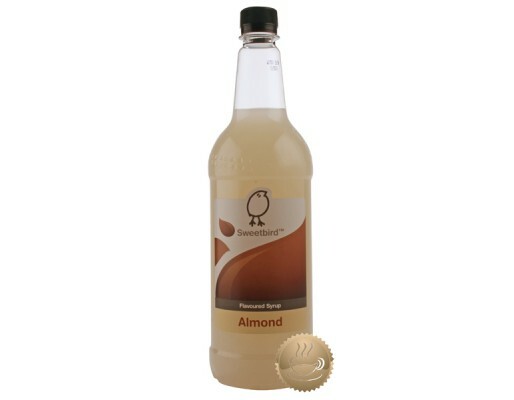 We have a whole range of drink supplies that will help satisfy those with a sweet tooth! A1 Coffee Recommendation: Have a read through our blog, to discover our syrups and vending machine coffees. Explore our range of syrups too!